It's happened again. 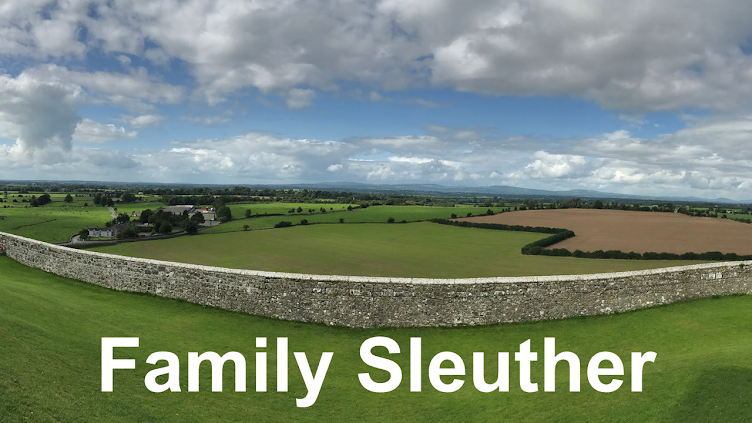 Social media played a key role in solving another family history mystery. First, it was Twitter (See: Tweet & Tell: Oral History Surfaces). This time it's Facebook. This past summer I inherited an old family photo album. 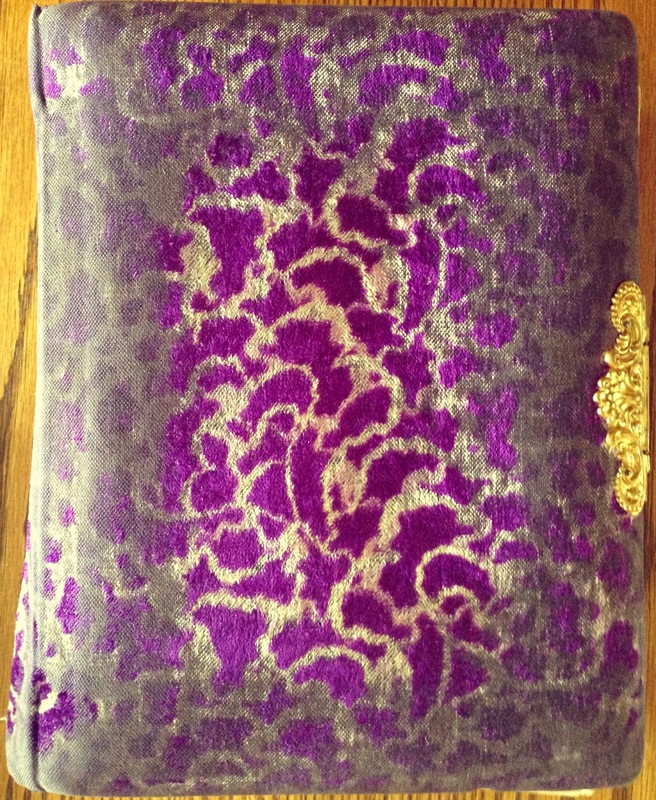 Its plush purple velvet cover was faded from years of family thumbing through it. The fragile pages holding the cabinet cards were yellowed from age. When I first received the album, I removed each photograph with surgical precision. Every image was carefully examined and scanned. Fortunately, some of the photos were labeled. Unsurprisingly, a small handful were not. One image above all others stood out to me. It was a picture of an older man sitting beside an older woman, likely his wife. Between them was a young boy with his hand resting on the older man's knee. Standing in the background was a young woman with her hand delicately resting on a chair back. Gazing at the camera, all of them cast solemn glances void of any discernible emotion. The back of the photograph was inscribed, "To EO Hawks." EO Hawks would be my 3rd great-grandfather Edmond Oscar Hawks. The people pictured stuck with me. The faces of the older man and younger woman looked familiar. I felt like I knew them or had seen their faces before. Was it a family resemblance that I was picking up on? Scrutinizing the picture, I saw there was a clue not in the image itself but in the border. At the bottom, the photographer's name, Hooper, was embossed along with the studio location: Washington, Kansas. That immediately triggered a red flag. I have ancestry in Washington County, Kansas. My Haworth family. In fact, my 3rd great-grandfather Edmond O. Hawks was married to Iva Elzina Haworth. Was the photograph from Iva's family? I immediately turned to my online family tree and zeroed in on one man: George Chalkley Haworth. 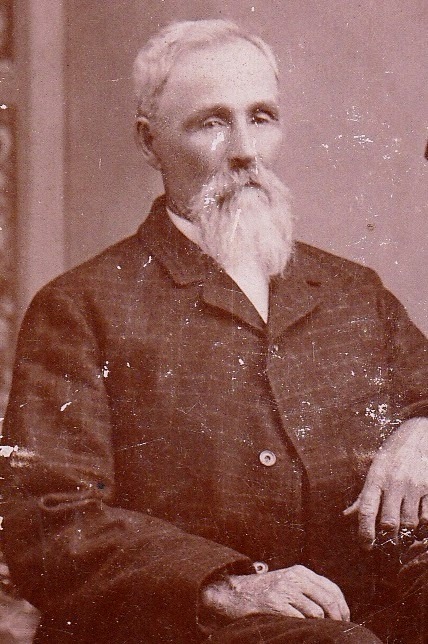 He was Iva's father - my 4th great-grandfather - and lived in Washington County. Following the death in 1865 of his first wife Mary Emily Hadley (Iva's mother), George remarried to Ann Simon. George had many daughters with both of his wives. However, with his second wife Ann, he had one son Robert Elwood. Robert was born in 1884. I figured the boy pictured was about six years old, which, if this was George and his family, would suggest that the photo was taken in approximately 1890. Based on the clothing, that seemed plausible. I decided I needed help to confirm my theory. I shared the photograph with the Haworth Association of America, a group of descendants that research all things Haworth. The photograph was posted on their site with a call for help in identifying those pictured. I also posted the picture on this blog's Unknown Photos page with the hope someone would glance through the images and serendipity would lead to an answer. After half a year, lightning hadn't struck. Neither effort yielded any promising leads on identification. I decided to take a more proactive approach and research descendants of Robert Elwood Haworth. Perhaps someone in his family inherited a similar photograph and could confirm my hunch that he was the young boy. Robert had three children, and I was soon able to locate surviving grandchildren. Leveraging the power of social media, I plugged those names into Facebook. In minutes, I found two of his grandchildren with profiles. The beauty of Facebook is that you can message anyone. You can even include attachments like a mysterious unlabeled black and white photo. I wrote an introductory note explaining who I was, that I was researching family history, thought we were distant cousins, and that I had a picture of - I believed - our common ancestor: George C. Haworth. Could they confirm? Had they seen it before? Here's an important tip for genealogists: Do not send your message to someone with whom you are not friends. It'll go into a wasteland where it will sit unread while you wait impatiently for a response that's never coming. When sending messages through Facebook to people with whom you are not friends, you have the option to pay $1 and put your message in their primary Facebook in-box. Do it! If you don't, it will be delivered to their "other" folder and won't ping them with a notification that they have an unread message. Your $1 tells Facebook you're serious about this message and ensures its delivery with a notification. It's a small price to pay to put your angsty genealogist's heart at ease. I sent the same message to two grandchildren of Robert E. Haworth. I attached the photograph to both messages. And I paid $1 to send each message. Then I waited. "Yes - I have that same picture hanging in my dining room. 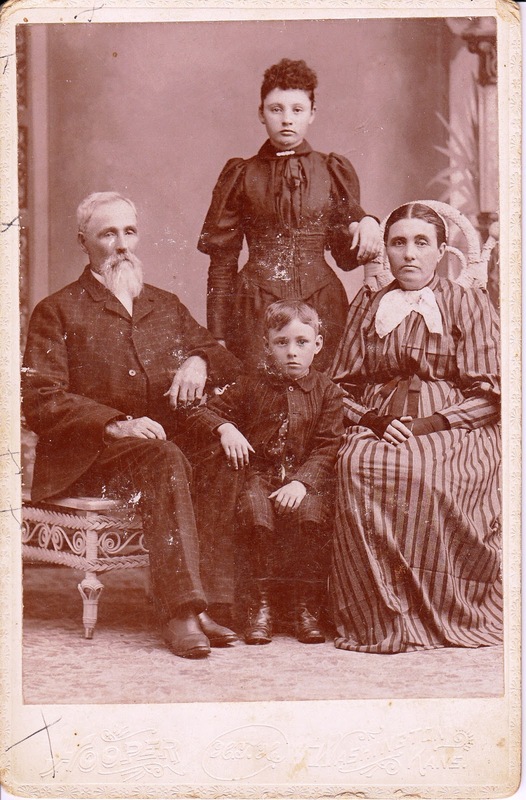 That is our great grandfather George Chalkey Haworth, Ann Simon, my grandfather Robert Elwood, and his sister." After six months, I had corroborating confirmation. It only cost me some genealogical detective work to uncover Robert's descendants, a Facebook message out of the blue and $1. I finally had affirmation that I possessed a photo of my 4th great-grandfather. Please, allow me to introduce you to George Chalkley Haworth. The value of a picture is more than a thousand words, particularly when it unveils a previously never-before-seen image of your great! great! great! great! grandfather. For that, I am four times grateful to Facebook and its indispensable role in connecting me with my distant cousin who had all the answers hanging on her dining room wall. This is awesome! I agree that Facebook is an amazing resource for family history. Congrats on connecting with your cousin and finding the answers you had about your photograph. Thanks, Jana. It's been a pretty exciting discovery for me. I appreciate you stopping by and commenting. Thanks for including the post in your Fab Finds, Jana! As always, I appreciate it. How wonderful that you were able to confirm George Chalkley Haworth's identity! That is so cool! Congratulations! It really is, isn't it?! Thanks for visiting, Amy, and for re-tweeting! Grays, Petersons and more. I have a question for you? Unfortunately, Facebook retooled the way they manage the messaging system late last year. The option to pay $1 and put a message into a Facebook user's primary in-box is no longer an option.